Sluban is a new brand of building blocks that fits perfectly on other building blocks. 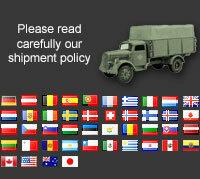 Sluban is available in Europe since 2008 amongst others at toy stores and online stores. Sluban has a wide range with many different themes and products suitable for children aged approximately from 6-12 years old. The variety of product themes offers many hours of fun for all ages! Sluban Ambulance M38-B6000 building blocks that fits perfectly on other brand building blocks. Sluban Anti-Tank Gun M38-B5900 building blocks that fits perfectly on other brand building blocks. Sluban Armored vehicle M38-B6300 building blocks that fits perfectly on other brand building blocks. Sluban Artillery M38-B0587E building blocks that fits perfectly on other brand building blocks. Sluban Attack helicopter M38-B0298 building blocks that fits perfectly on other brand building blocks. Sluban attack helicopter M38-B5700 building blocks that fits perfectly on other brand building blocks. Sluban Chinese WWII Soldier M38-B0581L building blocks that fits perfectly on other brand building blocks. Sluban Cop with Blue Beret M38-B0585A building blocks that fits perfectly on other brand building blocks. Sluban Cop With Cuffs Of Gold M38-B0585C building blocks that fits perfectly on other brand building blocks. Sluban Cop With Gas Mask and Shield M38-B0585E building blocks that fits perfectly on other brand building blocks. Sluban Cop With Helmet And Camouflage M38-B0585B building blocks that fits perfectly on other brand building blocks.